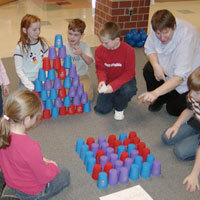 This hands-on workshop about number sequences uses stacking cups, an activity increasingly used in physical education classes. Students learn about the benefits of ambidexterity while exploring square and triangular numbers. Leslie and Jay Cady target small group cooperation, different learning styles, and strategies. Fees: $220 single, $190 each for 2 or more on the same day / The break between workshops must not exceed 90 minutes to receive the reduced rate. Title 1 Schools may qualify for funding assistance. Requirements: Large open floor where students can work in groups of three. If more than one workshop is booked in one day, the workshops should take place in one room and have the students come to the artists because of set up and tear down time.